Gosport & Fareham’s final London one south game of the season against Chobham marks the end of an era at Gosport Park tomorrow (3pm). It is the final game for number eight Chris Thompson at the end of a long and distinguished career at the club. The 37-year-old is retiring after playing well in excess of 250 games in a 17-year spell with the Blue and Golds. Affectionately known as ‘Sumo’, Thompson is a highly-respected figure in local and Royal Navy rugby circles. Gosport coach Neil McRoberts has called on his side to prepare for the impending departure of a key team player by giving Thompson the winning send off he deserves. ‘We couldn’t have asked any more from a player than what he has provided for us over the years,’ said McRoberts. ‘He has been a massive influence and always leads by example. ‘Personally, I can always notice the difference in the changing room and pitch when he isn’t playing. ‘He is a down-to-earth guy who just gets on with his job. It is also the final game for Kiwi pair Caleb Kingi and Levi Hui Hui before they return home. Though bound to finish in the bottom three after a disappointing campaign, Gosport know they won’t be relegated. 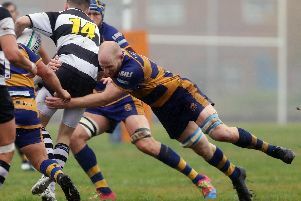 They have been given a reprieve by the enforced relegation of Medway by the Rugby Football Union (RFU) for incorrectly registering a number of players. Fareham Heathens bring the curtain down on their successful Hampshire one campaign with a visit to title-chasing Millbrook (3pm). Defeat at home against Bognor ended Heathens’ hopes of finishing champions but they still aim to finish on a high. Coach Bernie Rhodes said: ‘It was disappointing to lose against Bognor and have our title chances dashed once and for all. ‘There is no pressure on us now and we can go out and enjoy the game. ‘I am sure the lads would love to take the scalp of Millbrook but we know it will be tough. ‘We know that third place is the highest we can finish. ‘That is a great achievement when you consider three seasons ago we were second from bottom of Hampshire two.